Are they custom, or are they EDM OEM or what? I really like the way they look and I've always wanted them on my Lude. Re: Does anyone know what tail lights these are? Painted altezza's. I personally love them. Yeh, I notticed they looked a lot like the altezza's, i just never saw them like this. Was never a big fan of altezza's, but they did a good job on these making them look more stock than aftermarket rice. I've never seen these on ebay or for sale on any site, I wonder if the owner painted them himself or what. They look pretty clean for altezza's. I think they are the oem mounting piece with a painted alteza cover on them. If that makes since. Pretty much an oem and alteza tail light morphed into one. Sweet, I'll definitely have to find the DIY on this. Thanks. I have done this with the transparent model paint from hobby lobby. It is pretty easy to do if cleaned and prepped properly. Did my civic lights 2 or 3 years ago and to this day they still look as good as the day they were done. Love that trunk lid too! 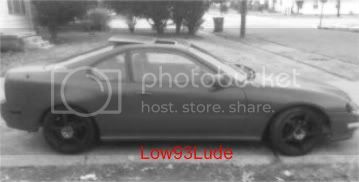 Red 93 Lude w/ H23 built with H22 Head and converted to OBD II! and sorry for being lazy earlier lol. heres the link to the DIY guide. and i believe they are painted but dont mark my words but any way i havent seen lights like this for sale in a while! (ebay and other sites) so if they're discontinued you can always go this route with literally any style altezza. (and by this comment i just said i am reffering to what mobsta saud above me.) Hope i helped! Last edited by HpreludeH; 02-20-2012 at 06:45 PM.